Hello ISD 194. Based upon feedback from "Waking Up White" Book Club participants, your equity department has decided to offer another opportunity to further learning. This documentary is highly regarded and won a SunDance Film award. It was created in the suburbs of Chicago's Oakpark and River Forest High School. The documentary is about achieving equity and overcoming biases in education. After receiving numerous requests, the equity office is offering a new opportunity for staff to continue learning together about issues facing our students and community today. The district has approved this work as an opportunity for LEAF staff to make up lost hours due to the inclement weather this winter. This module will be constructed as a film club of sorts. We will watch an episode together, at CHE, of "America To Me" and then follow it with discussion. Each episode is roughly an hour long, so each session will begin at 4:15pm and run to 5:45pm leaving 30 minutes to debrief following the viewing. It will run for 6 Thursdays beginning April 4th. The dates would be April 4th, 11th, 18th, 25th and May 2nd and 9th. There will be an online component with guiding questions. The online work will also be worth hours in case participants cannot attend each session. We look forward to learning and growing with you! 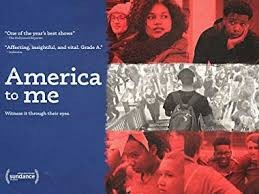 If this documentary sounds interesting, but you are unable to attend our film club, you can find it on STARZ with a subscription. CEU's will be available for those who participate.